This post is sponsored by McCormick. I’m partnering with them this season to bring you a brand new way to make green beans for your holiday dinners! Green Bean Casserole- Two Ways is the best way to make and serve a green bean casserole for a holiday dinner. Everyone will be happy! 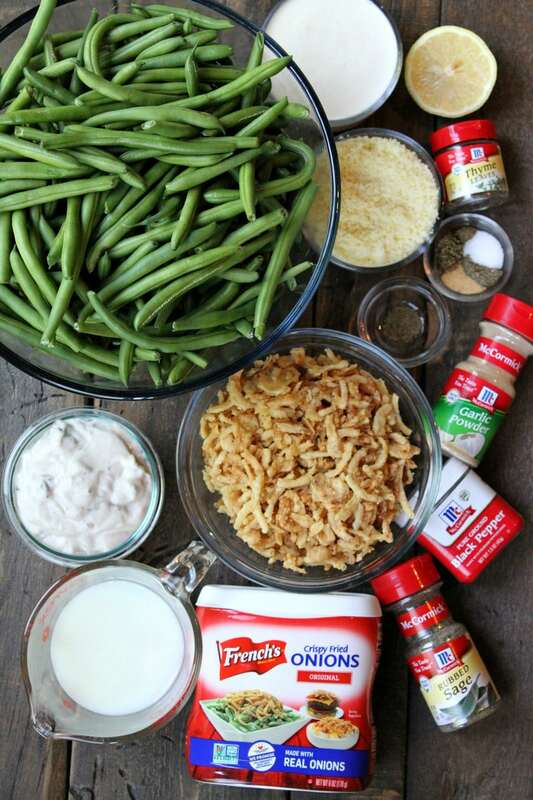 I’m sure the classic green bean casserole recipe using cream of mushroom soup and French’s Crispy Fried Onions is on everyone’s holiday menu already. Am I right? It’s the green bean casserole we all grew up with, and let’s face it… that casserole is a childhood favorite Thanksgiving memory for so many of us. My Mom made it every year. It was definitely a recipe to look forward to! I would never leave the classic green bean casserole off my list of recipes to make for Thanksgiving (we love it too much! ), but there’s a way to make it even better. 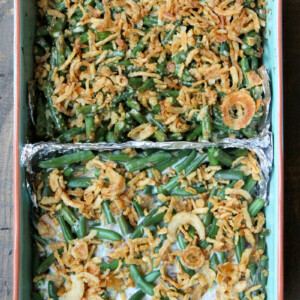 I’m going to show you how to make Green Bean Casserole- Two Ways! We’re going to make two different green bean casseroles in one dish! 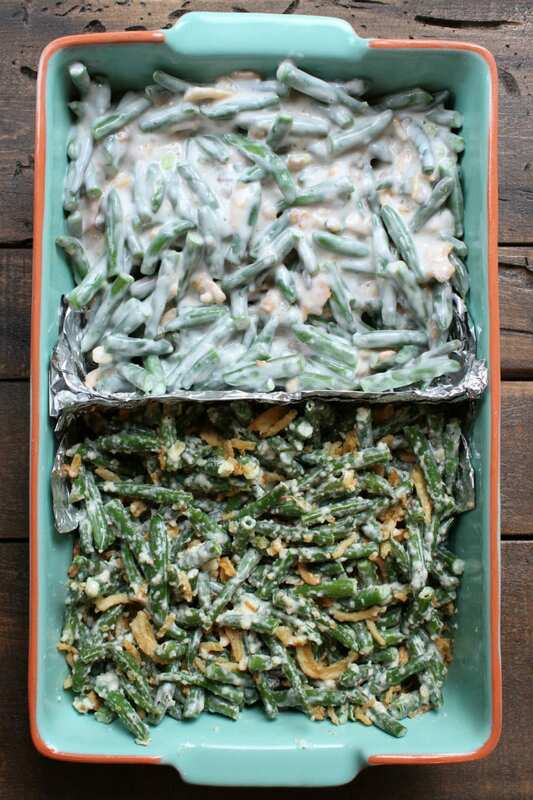 Here’s everything you’re going to need to make green bean casserole- two ways. 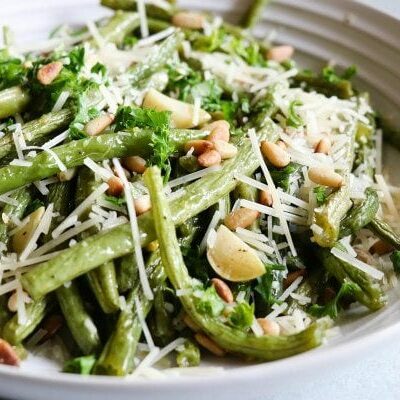 I’m using fresh green beans in mine, but you can certainly use canned green beans instead. This recipe is made delicious with highlighted McCormick spices: Rubbed Sage, Thyme Leaves, Garlic Powder and Ground Black Pepper. 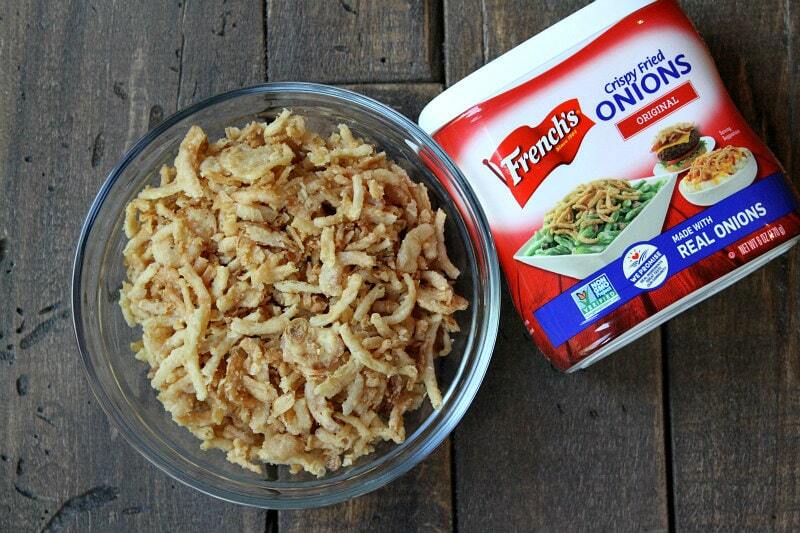 And there are plenty of French’s Crispy Fried Onions in this two way casserole as well! You’re going to start with a rectangular casserole dish, and use aluminum foil to divide it down the middle. I have two super-easy green bean casserole recipes for you to make, and you’ll put one casserole in each side of the dish. 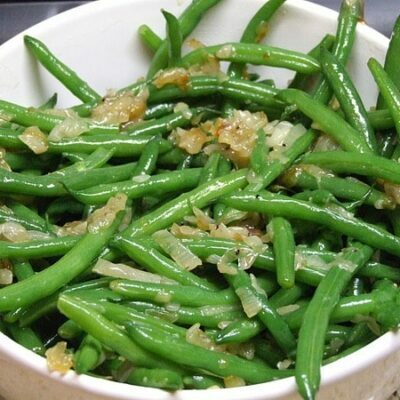 If you have picky eaters, they’ll be happy that they have two choices for green beans! 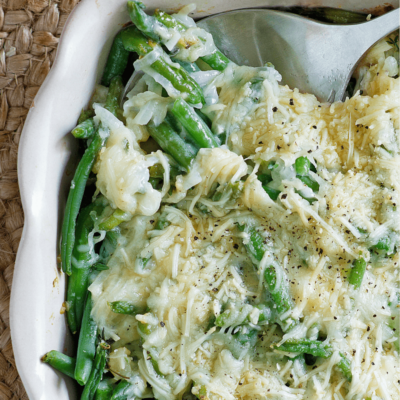 The classic French’s Green Bean Casserole will go in one side of your casserole dish. Combine cream of mushroom soup, milk and McCormick® Ground Black Pepper. Then you’ll add cooked fresh green beans and French’s Crispy Fried Onions. That’s it! Spoon that mixture into one side of your divided casserole dish. 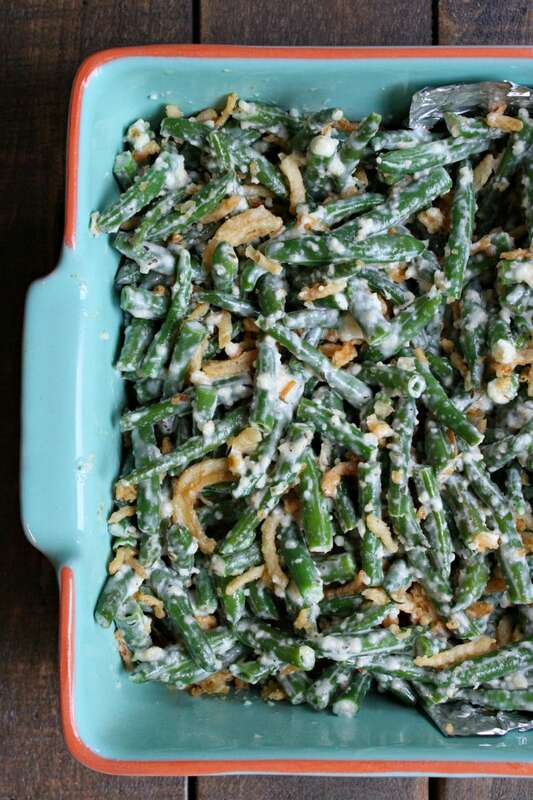 Garlic- Parmesan Green Bean Casserole will go on the other side of your casserole dish. Combine hot cream, Parmesan cheese, lemon juice, McCormick® Garlic Powder, McCormick® Thyme Leaves, McCormick® Rubbed Sage, McCormick® Ground Black Pepper and salt. Add fresh green beans and French’s Crispy Fried Onions. So easy! Spoon that mixture into the other side of your divided casserole dish. And here’s how it all comes together. 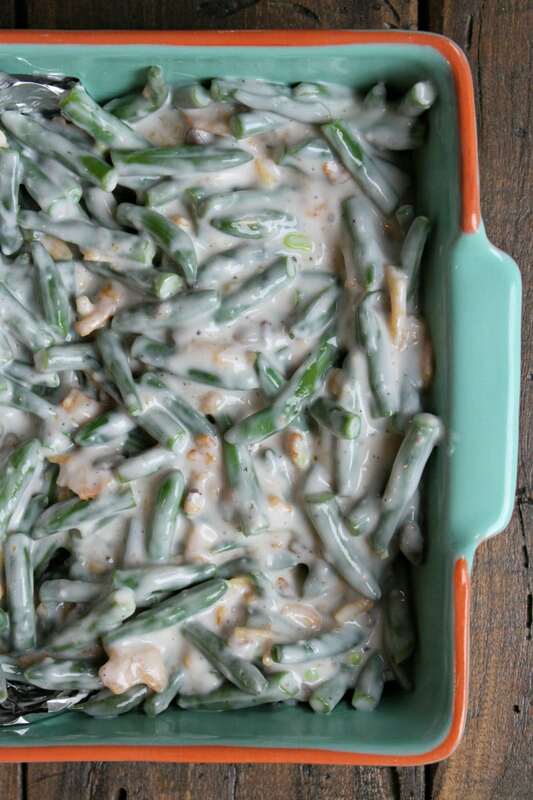 Two recipes for green bean casserole are in just one dish. Each are neatly snuggled onto their own side of the casserole dish. They are both baked at the same temperature for the same amount of time. Easy peasy! 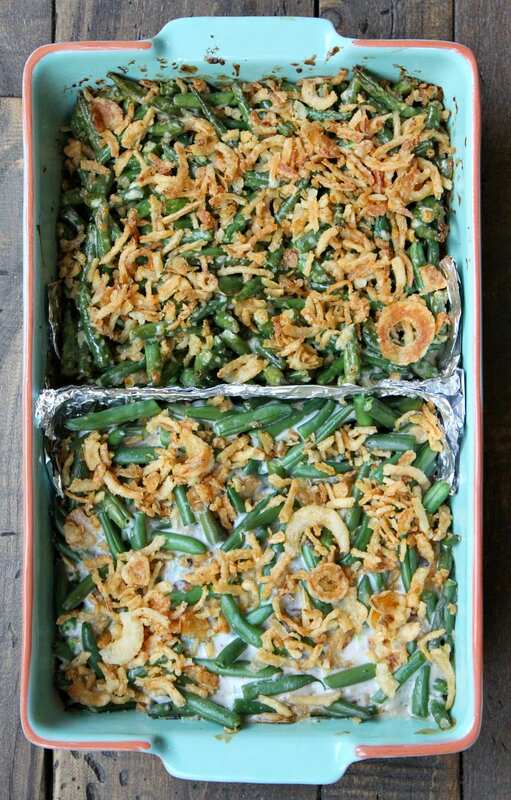 After 30 minutes in the oven, each of these green bean casseroles are topped with a few more of those fabulous French’s Crispy Fried Onions and baked just 5 more minutes until the onions are golden brown. Fresh out of the oven, your guests can choose which green bean casserole they’d like to have with their meal. They may choose to have the Garlic- Parmesan Green Bean Casserole, which has great flavors of Parmesan, garlic and spices- along with the crunch of the French’s Crispy Fried Onions. 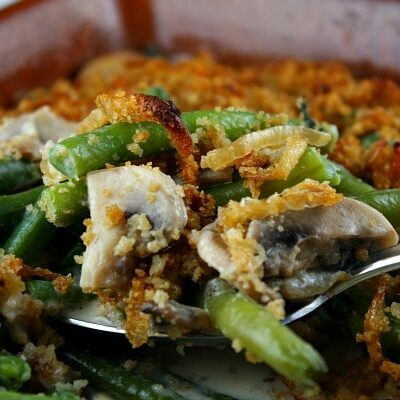 Or they may choose to have the classic French’s Green Bean Casserole- the creamy option with bits of mushroom and French’s Crispy Fried Onions. It’s nice for people to be able to have a choice of how they might like to eat their green beans. And I think everyone will appreciate this unique way of serving them. 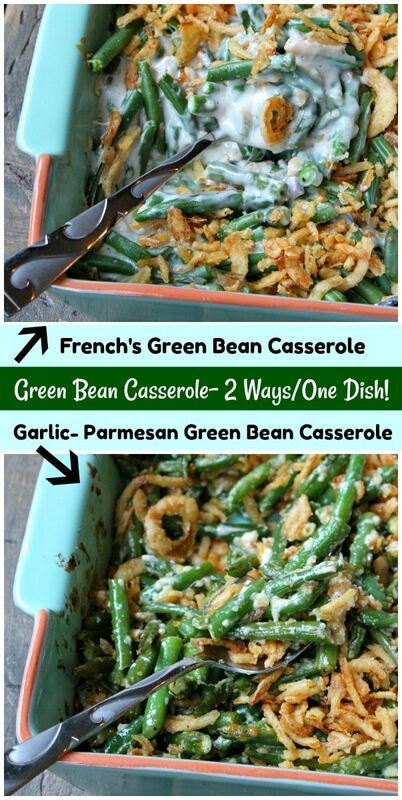 Or if your guests are anything like me, they’ll want to try a little of both green bean casseroles! 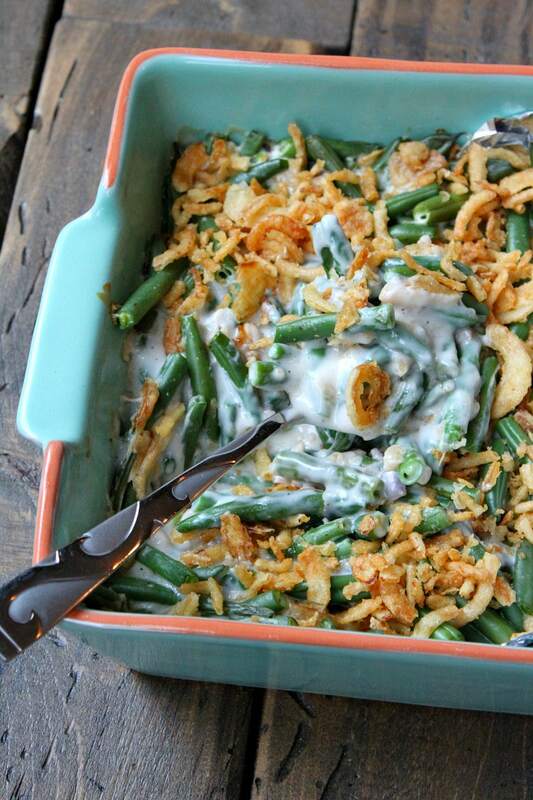 This Green Bean Casserole is twice as nice. It's the classic Green Bean Casserole made two ways in the same pan! Preheat the oven to 350 degrees F. Spray a 13x9-inch casserole dish with nonstick spray. 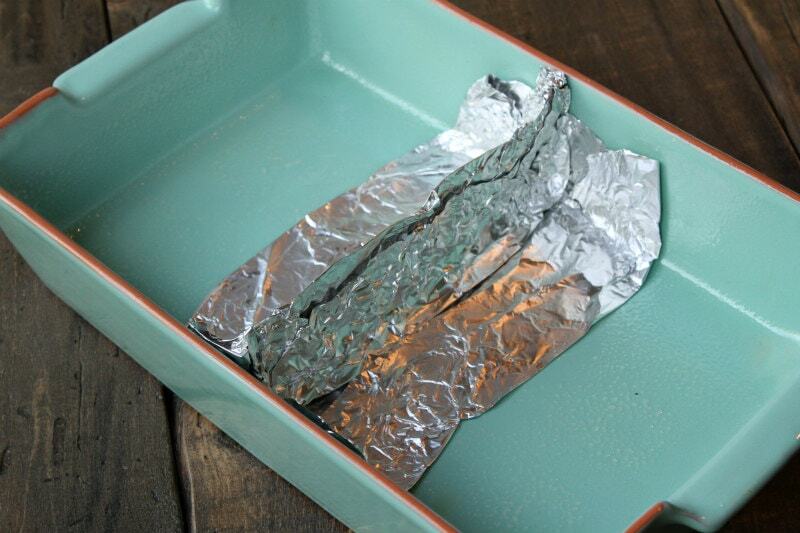 Use aluminum foil to create a divider in the middle of the casserole dish. If using fresh green beans, bring a large pot of water to a boil. Add all 8 cups of green beans and cook until crisp-tender- 3 to 4 minutes. Drain and run cold water over the green beans. Set aside. Mix soup, milk and pepper in a medium bowl. Stir in 4 cups of the cooked green beans and 2/3 cup Crispy Fried Onions. Spoon this mixture into one side of the divided casserole dish. In a small saucepan, heat the cream. Add the Parmesan, lemon juice and spices. Continue to simmer until slightly thickened. Remove from heat. 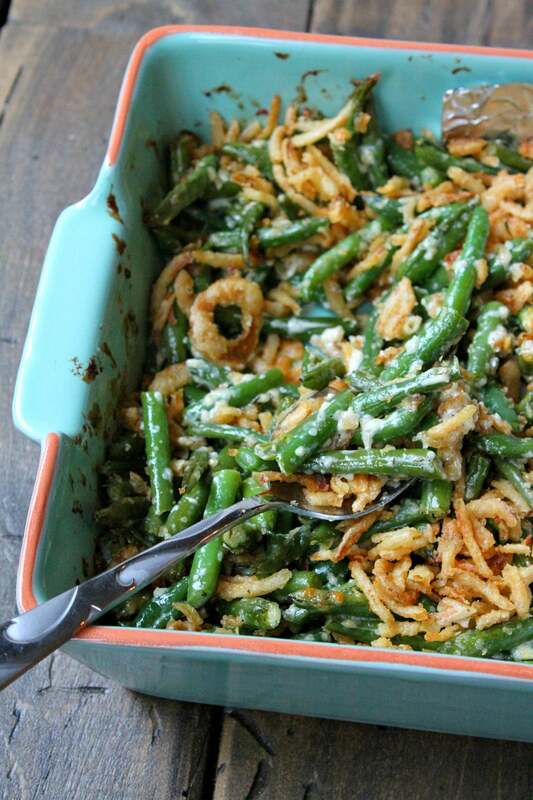 In a large bowl, combine 4 cups of the cooked green beans, the Parmesan sauce and 2/3 cups Crispy Fried Onions. Spoon this mixture into the other side of the divided casserole dish. Bake the casserole for 30 minutes. Remove from the oven, top each side with 2/3 cup of Crispy Fried Onions. Bake an additional 5 minutes, until onions are golden brown. Love all of the variations on this! I know which one my family will love. This is really a great idea!! Thank you so much for sharing! My family loved it! Super delicious, super easy! My new favorite side dish for Thanksgiving! I love both ways. Great Thanksgiving dish! This is a must have at holiday dinners. Lori – this is my go-to recipe every year for the holidays. SO GOOD! This is such a fun way to serve up a classic. I love the non-can version! mmmm…such an incredible green bean casserole!! I can’t wait to try it!! A holiday favorite! Love that you included 2 different ways to make this! I love this idea of making 2 versions at once! Two casseroles in one pan is genius. I’d have some of both! LOVE that this can be served two ways, so easily!!! Such a great trick! Fresh green beans make such a difference!